This is about to push up the price of old Record vises on eBay, but don’t be fooled by thinking the new Irwin Record vises being sold on eBay and other sites are the same as the pre Irwin Record vises because they are sold as ‘Record’ or Irwin vises. These vises and many other Asian knockoffs painted blue are not the same animal at all. Presently, on my personal benches, I have three Woden vises on the two benches at my home workshop and at the Penrhyn Castle workshop, have two personal benches there, I have two Record vises and a Woden vise. I have not found an import vise in the UK that compares to the Record vise. In the US they still have the Jorgensen 41012 Woodworkers Vise that has been around for decades and is fairly priced at around $150. Because Record sold off its tooling and production here in the UK ceased, Irwin Record vises are no longer produced in the UK but on another continent. The quality of castings does not match those of the original Record Marples and so longevity will likely match that of Asian imports which as yet has never compared to domestic British or US standards. I found three more Record vises I have collected under my repair shop bench this week as I was reorganising and clearing out my excess waste. These were well rusted when I bought them so cleaned off the rust with plastic and wire abrasive discs and pads, fettled the moving quick release components whilst I had access to them and greased and oiled all other moving parts ready to install as new benches come together. It’s always a good idea to strip down the components and remove any rust as the rust tends to slow down the movement of the quick release or cause the engagement to slip just as you are about to cinch up the vise jaws on the workpiece. It’s a simple matter to remove the cast block, abrade off the rust and reinstall. I prefer the bulk of this work to be done with a coarse plastic abrasive disk, the ones used in metal working industries for the same purpose, as this literally removes the rust without causing damage to the metal or too much reduction. I find this especially so on the parallel bars either side of the screw thread. On the screw thread itself I used a 2″ diameter wire wheel. This went deep into the internal corners of the threads and removed any and all rust. Once completed I waxed the newly exposed areas around the jaws, greased the threads inside the threaded block that receives the screw stem and greased the screw rod. The vises are now ready to install. Myths busted – Do Quick-Release Vises Work? Are all the Record vises equally good as long as they were made in England? It seems there was a change in the England-made castings in the 60s or 70s and I don’t know if this like Stanley and other makers spoiling good tools. The one you show here is one of the older ones while the newer English Records supposedly have a flat rather than round end to the screw where the handle goes through. I am sure things decreased quality even when Record was Record. Partly because there was a transitional run of companies buying out the company by companies such as Bahco, American Tool, Praxair and finally Rubbermaid. When it was Record and Record Marples things had alrady started to diminish in quality. I’m not altogether savvy on the the Record history, but comparing older with the era you speak of does show that quality was worsening and weaker parts being installed. That said, the pre Irwin involvement at least meant it was being made in good British foundries and factories. I just finished your Bench and have to install my vice and I think I will put a couple coats of paint on the aprons and legs. I bought a Record 52E for Highland Hardware back in the 80’s before Record was no longer available. It is one massive vice and should serve me well. Thanks again for everything you share and do, I have learned so much from you since I have discovered your Blog and Woodworkingmasterclasses. Curious what kind of grease do you use, I have dusted it off and put a couple coats of wax on it. Actually. I usually use furniture paste wax because I have it in and it works well. Thanks Paul, I have Johnson’s paste wax and use it on all my tools. Also my vice is a Record 52 1/2 made in England not a 52E which I called it earlier. Paul- I have a new Eclipse vise stripped apart and am confused over where you use grease, where you use wax, and where you might use oil. Are you saying you use furniture wax everywhere including the main threaded rod and the quick release split-nut threads? When you periodically “oil” your vise, are you applying furniture wax to the guide rods and threaded rod, then? If this were just a mechanical device I know I’d grease throughout, but in the woodshop, that doesn’t sound right. Last week my brother bought a Paramo vise from a 74 year old guy in Holland. Since he was more of a metalworker, he never used this vise and it had been laying in the shed for 40 years. Luckily it was well greased and preserved (metalworker). He also sold us two sets of cramp heads, also Paramo. He bought these back in the late 60’s/early 70’s. The items are also great quality and similar to Record, also made in Sheffield, but fairly unknown. just found a Record 53 in the garage. It’s bigger yet than the 52 1/2E, 101/4″ wide and 14 1/2″ travel. Just for info — found out a little more about UK woodworking bench vices: – seems people used wooden vices (maybe a steel screw) or engineering type before Parkinsons (Bradford/Shipley) and Woden (Birmingham/black country) came along. Parkinsons seem to have patented the buttress thread/quick release. The same family (Hampton) made Woden in the Midlands and later (different company, butother members of the Hampton family) Record in Sheffield. These three makers were the main players (each with a large range of engineering and woodworking vices). In the UK there was also Rededa (don’t know where) with a similar line, and from the time of WW2, Paramo (Paramore Ltd of Rotherham and Sheffield). Quite a few vices were labelled Marples, the earlier ones being made by Parkinsons, later I don’t know. Fortis and Swinden also made special vices in the UK (eg rotating). Eclipse (Sheffield) just made engineering vices. As well as quick release Perfects, Parkinsons also made the Popular and Samsonia ranges. In a Buck and Ryan catalogue of 1964 Parkinsons, Paramo and Record alla have very similar specifications and prices (but some design/casting differences). Apt timing! I picked up a Parkinson’s Perfect Vise 15 in a tool shop this morning. Really good condition, the seemingly original plum colour paint is all there. Hadn’t seen them until today, then here you post! Thanks for the info. All of that aside, this is a good post for what to look for and how to refurbish the ole vises. For most of us the Lee Valley vises out of Eastern Europe will last a life time. P.S. this is John Guengerich, the Discus log in that I used to use hasn’t been functioning so I’m using my FB. Thanks for this insightful post Paul. After reading it yesterday I bid on and won, a 52 1/2 & and a 53, winning the pair for under £90. I picked them up last night and they look great! Now to finish your bench so I can mount them. That’s a pretty good days work. These vises are well worth that price per one not two! It is hard to deal with different makers these days as they switch things around so much. Remember the Nicholson file company that switched from making their own US -made manufacture to manufacturers supplying them from Mexico. As far as can be known these Eclipse vises are still good vises. Anyone else know anything to help Ed? Years later………………… October 23, 2016. I installed a new Eclipse nine inch quick release vise last year on my new workbench. It has worked flawlessly since then. In one of your recent posts on the leather lining for the vise I thought to see that the threaded rod itself is also protected at he original record vises. My york vise has the thread fully exposed thus catching a lot of dust. Did you retrofit this or is it an original feature of the records? Yes, that was an original feature of the Record vises and it includes a squirt hole for oiling the thread. Fact is, there is no modern maker matching what Record and Woden once had. I think the Woden to be every bit as good and better than Record, but that said, an old Record is tough to beat. Beginner’s question: I am restoring a record 52 thats in pretty good shape with a good coat of surface rust everywhere. Started off with soaking it in apple cider vinegar and the rust is coming off quite well. I wanted to take the vice apart to clean the quick release parts with the disks as you describe above – but I can’t get the pin out of the end (which I assume is necessary to take it apart – I haven’t found any instructions on how to break it down). I pounded on it for a little bit with just a hammer but I was concerned that I might deform the pin or bend it out of alignment. Is there a method to removing the pin or should I just keep hammering it? The only time I have taken a vise apart is if it was broken, not for general maintenance. Once you clean out the threads with a wire brush, that is enough. Then just oil regularly and the mechanisms will all work well. I have answered this in a private message to you. I live in Melbourne. I have bought a Record 52 1/2 quick release, a 52 quick release and a 52D (slow release with dog) recently on ebay and gumtree. I paid just under AUD 100 for the 52 1/2 and just over AUD 50 for the 52’s. All were in reasonable but well used condition, with a little surface rust, paint splats, minor nicks, etc. I have since sold one of the 52s for a similar price – and the buyer paid to freight interstate. If you do an advanced search on ebay.com.au for “record 52 vice”, and check the “Sold listings” and “Only show items located in Australia” you will get a few hits. My brother gave 2 Revord vises no 52E made in England, they are realy mest up, very rusty and some pieces are broken, cannot open them, I dont know if it is worht to keep the, I can send you photos of both vise, can you tell me if these are repairable and if so what shall i do? The pix will help, glad to look. How good is the Jorgensen 41012 in comparison to the Record 52 1/2? I live in US and am just starting out in hand tool woodworking as a hobby. I have nothing right now except a moderately sturdy workbench (nothing like yours you’ve vlog’d) and nobody locally to look to in the age of apprentice-less-ness. So thanks for all you do. I’m excited. So anyway, I have no squares/clamps/saws/planes and no vise. I will probably go cheap — but not too cheap — for now and replace as I can since I have to buy a fair number of things at once (think Craftsman with the lifetime warranties). However I don’t want to replace a vise down the road and was wondering how these two compare. For me, it’s a $130 price difference eBay Record 52 1/2 vs Amazon Jorgensen easily with shipping which is almost comes to 2x price of the Jorgensen. While I’m at it, love the videos, blog and especially the master class site. Thanks for all you do. The Jorgensen is a good vise and will last a lifetime. If you can find a quick release vise I think I would go for it. I no longer recommend Record Vises because I don’t know where they ae made or whether they live up to the old original models made by the original Record company. I wanted to buy a record 52 1/2 from ebay.uk, but I have many difficulties cause they don’t ship to Italy easily. Could you tell me if any of the record 52 are good vices? Could you help me suggesting other record vices? I have the same question. I wonder how the smaller 52 works as a bench vice compared to the more standard–and larger and more expensive–52 1/2. Could someone who is knowledgable about these vices give some advice? I can’t claim to be super knowledgable on Record vises or super experienced as a woodworker but I do have an old Record 52 so thought I’d give my two cents. In general, I have found it to be a very good vise. The quick release is very handy, it feels very solid even when fully extended, and it can generate a lot of clamping pressure. So its great for clamping small parts while doing fine work or short-to-moderately-long boards for edge planing. The only functional issue for comparative purposes that I have experienced is that the jaws are quite small and they don’t project much past the screw and guide rods. Together with the small height of the jaws (around 2.5in I think), this means you can only clamp very short or very thin items vertically between the jaws with any great degree of security. You can add longer wooden jaws (which I have done) and this increases the functionality of the vise but doesn’t feel as secure as when you can get them right between the metal jaws. This issue would be less significant with the 52 1/2 and especially the 53. So I would probably go with one of those if I was out on the market looking to purchase a Record vise. However, that said, if you mostly make smaller projects such as boxes (like I do) and can get a 52 for cheap or even free (as I did), I think it is undoubtedly a handy and capable vise. Paul Selleres….Did I read you correctly???? You have about 5 of the old Record Vise (Vices) hanging around your place??? No one should have that many..Please package at least two of them and send them to me here in Australia!!!!! Now…and you pay the freight. I have looked for perhaps 5 years for an old record quick release vise and got lucky last week for $50.00 (Aust$). It is a mess but I have reconditioned a couple of old vises with good results. I must say the quick release mechanism worries me a bit (it is very strong) so I am being careful.. I have an old woodwork bench with two record quick release vises at either end.It was originally in a school and therefore badly gouged and scarred with various names, initials and teenage pledges of love and affection! I am currently in the process of restoring it. I am wondering if there are specific countersunk bolts to fix wooden jaws to the metal jaws from the inside? If what thread are they and where can they be acquired? Kind regards, Ron Lalor, Ireland. I see them all the time on eBay for a couple of pounds. Help!! can someone help me please. i recently bought a Parkinson’s perfect vice 15, but it’s not too perfect. it winds in and clamops something up great but it will not unwind, the ‘clamp’ that sits on the winding thread just jumps and sits back in it’s orininal place without opening up. i’ve stripped it down and i can’t see any wear on any of the individual components, but it still will not unwind. HELP. Is it degunged, oiled and are the two bars free from the wooden jaw liner at the bottom? I have an English made Record 52 1/2 which I bought new in the mid 90s’ (£50) and it has done pretty well. However using it in a rather naughty way, I have bent the end plate and the quick release and screw does not work correctly, ‘clicking’ ie not engaging properly to unscrew. I’ll give it a go flattening the end plate and relocating the quick release dog. If necessary I can get someone to put some oxy/acetelyne on the end bracket to allow hammering flat. If you really want to know, I was using it to push new wishbone bushes into a wishbone for the car….. Anything else I should look out for? I purchased a used nine (09″) Record bench vise from a mechanic that had a number of used vises acquired from a local school board. Apparently they were discontinuing their wood shop program due to liability issues. The vise slips when I attempt to apply pressure, plus the vise will not close equally edge to edge. Please confirm what I need to look for (trouble shoot) and what parts I need to replace if required. If the vise has wooden jaws fitted, check that there is a gap between the bottom edge of the wood and the parallel bars on the bench side. If this catches it causes the vise to slip. If the vise closes to parallel under moderate pressure it will work fine. You can correct things like this if it has been strained out of parallel by making the wood liner out of parallel to match. You can also create toe-in this way too, so that the top edge meets first and, under pressure, closes onto the work. i found a record tools #58 i was wondering how much it might be worth? I don’t know, i’m sorry. I recently aquired a Lion vice. Still building bench so not used it yet, but it looks good. design obviously copied from record et al. If it lasts as long again, as it has so face, then it will outlast me. recently saw a second hand Irwin record 52 1/2 for £99. Seemed a lot of money! It’s questionable where the Record Irwin vises are made. I keep meaning to find out. I am wondering if it would be frowned upon to have an old 52 1/2 painted in a colour other than blue? Would it be a form of blasphemy to have it done in your colour of choice? I wouldn’t care as long as it’s well done and you are not trying to sell it. I have the fortune to have purchased a used # 53 Record vise. Unfortunately the vise slips when I try to tighten up in one motion. If I slowly tap, tap, tap on the handle I have success. I understand the half screw may be the problem. Is there a source of supply for parts in your neck of the woods or over here in North America (Canada)? Have you cleaned it and oiled it yet? Cleaned and oiled with a recommended lubricant. One other item that I forgot; the vise jaws are not parallel , when closed up. How would I adjust this issue? Is that a vertical parallel or along the top edge of the jaws? The jaws are manufactured with toe in so that when pressure is applied the parallelism is established. Bert, I would be totally upset! Out of parallel from left to right along the top edge of vise. Just a thought. A picture is worth a thousand words. Is there a process to attach a photo next time I send a request for information. Still like to know if anyone has a supply of parts for record vises. Similar to a used auto parts supplier. Thanks Paul for an interesting blog about Record quick-release vices. I’ve collected quite a few of them over the years and think that the Record 53A (fitted with a dust cover over the buttress scew) is the very best, especially the 1930s pattern with the patent No. 664709 on the front jaw above the handle. It was replaced in the late 1950s by the 53E that was produced throughout the1960s, but this slightly more expensive model fitted with the dust guard was eventually discontinued. I’m also of the opinion that the later 1930s Parkinson’s Perfect Vise No. 16 is a superb alternative to the Record 53, and a dust guard option model (No. 16C in the catalogues) was available. Parkinson’s Perfect Vises were in production well into the 1960s and were just as good as Record, perhaps even better in my opinion. Well colour me a happy man! I began watching your clips on YouTube a couple of weeks ago, and I’ve loved every minute of them. My father was a builder and joiner (his profession on my birth certificate is “Journeyman”) all the while I was child growing up, so I was always around building sites and woodworking. Then the grant system all changed and it left it very difficult for him to get work, so he went back to college and learnt to be an IT technician (at the age of about 50! He’s got an incredible mind on him, and an amazing ability to adapt to new situations). Unfortunately this meant that he was unable to pass on to me the same kind of working skills and knowledge that my elder brothers were able to learn from him – a fact that he’s always been bitterly disappointed about. I’ve wanted to learn the skills for a long time (it’s in my blood from growing up around it), and your videos have really given me a firm direction in which to begin building them – so thank you for the videos you make and the time you sacrifice to impart your wisdom. You’ve got a love and passion that’s clearly apparent and is completely infectious. I won a bid on ebay last week for £13.50 which included a Record 52 quick-release vice in pretty bad nick (quick release isn’t working as yet, and it’s massively rusty) but nothing a bit of elbow grease can’t cure. Then, whilst out collecting another ebay item from a junk shop today, I spied a Record 52 1/2E quick-release buried among everything that I couldn’t let slip by. He was asking £25 for it but I haggled him down to £20. It’s rusty, but I’ve begun work on smoothing all the metalwork back down to a good surface, and the quick-release works perfectly (even though rusty). It’ll be moving like silk once I’m finished with it. Blooming phone changed Paul to read as Peter! Sorry about that. To be honest though, Peter Sellers was a genius in his own field too. I picked up a 89/2 Woden a few months back for a tenner. It was via an app (Shpock) for local buying/selling. The guy wanted £20 for it which I was MORE than happy to pay, but when I got there, I tried to test the QR, but due to the weight of the vice in one hand, and trying to open with the other, it didn’t move easily. Then, without any prompting, the guy said he’d accept £10 for it – I didn’t argue but I do feel a little bad – it was ( and is still) worth a lot more. It’s in good condition really, everything works as it should, clean, jaws close tight – can’t complain at all. No idea how old it is – 50s/60s I would have thought. Great vice – would have been nice to have had one with the drop down dog on the jaw, but i’ll live. On the lookout for a tail vice now. Then i’ll start on my bench, drawing inspiration from your bench, Paul. Did you ever consider adding a deadman to your design? For support of long lengths whilst held in the vice? I’m thinking of incorporating one whilst i’m going about building a bench – i’ve always managed without in the past, on my current ‘bench’, but I can see it’s value. Is it possible to have a Blue Vise that says Made In England with the quick release etc.. and have it not made by Record? I have one that says Made In England 52 1/2 D on it… but does not say Record. Is this a genuine Record Vise? Not so far as I know. It may still be a good vise though. Paul thanks for getting back to me so quick. I saw this one today on eBay. auction had ended, but it looks kind of like mine. Says Made in England… but no sign of Record. Could this one be real? Paul – Thank you for the quick reply. The vise I have is like this one on eBay. Is this one a real or fake record? Thanks again for your help. It looks good ,Patrick, but I have not seen one without record in the casting. Interesting…. Seems I’m not the only one with a brandless ‘Made in England’ vise…. Two weeks ago I found a woodworking vise in a thriftstore, no brand on it, usual blue paint, in a very good condition. Price was good too – equal to that of a Big Mac. All it said on the front jaw was ‘No. 57’ and ‘Made in England’. So I initially assumed it was just a brandless knock-off of a Record, since there was no brand name on it (as if the maker was ashamed to be identified with the vise). But after comparing it with pictures from other #57s on the internet, I can see *no* difference whatsoever with the genuine Record #57. If it’s a copy, it’s a *very* accurate copy… Also, it’s pretty sturdily built, definitely not flimsy or cheaply made. Whether it’s a genuine Record or not, I do not have any complaints about this vise. So now I’m wondering, if for economic/contract/marketing reasons Record (or another company) made these vises without their brandname on it but using the same moulds and tooling? Purely academic, because either way, I’m very happy with this vise. Its smaller size is ideal for my smaller bench and the usually smaller/lighter tasks I have. It lacks a quick-release but I’ve never had a QR metalworking vise either, so I’m not really missing it. Can’t miss what you’ve never known. I do have two metalworking vises, so I expected the #57 to be used only for the occasional woodworking I do. However, it turns out that it has now become the vise I use the most, due to its location on the bench and height. Incidentally, the wooden-liner mounting holes in the rear jaw weren’t threaded, so I cut M6 thread in it myself. Not sure if the factory forgot to cut threads or whether doing so was normally left as ‘an exercise for the new owner’. Your assessment is perhaps likely to be a tad off. Lots of tools and aids came on the black market when less than scrupulous workers removed the makers name they were working for and used the same castings. It was just a question of filling in the reverse name in the casting sand, pouring the casting and restamping the sand again later when the next batch for ‘original’ parts were ordered. Of course there was the seconds quality too, where the name was ground out and the product still working model. Bootleg or not, the vise appears to be decently made – much better than what is sold new nowadays in home-improvement stores. Turns out I didn’t know how much I needed (wanted) a woodworking vise until I installed this one on the bench. I found using a citric acid bath (225g of citric acid powder for every 4 litres of water) works best, it doesn’t take a lot of effort and can get into hard to reach areas. A really useful box was the only thing I found big enough to fit some of my vices. 1) First use a pressure washer with soap to remove any grease. 2) Add soap to the acid bath mixture to help lift any leftover grease. 5) Dry fully with cloths and a hair dryer then fully oil/lubricate all parts. I wasn’t too popular with the wife for stealing her hairdryer but it was worth it, the vices are completely rust free. I bought most of my vices from Gumtree or Ebay, most were covered in rust. So far I have 2x Record 52 1/2 E , 1x Record 52 1/2, 1x Woden no2 all working perfectly. Does anyone know of any guides for vice repairing? It would have to cover fixing the quick release, trouble shooting, how to strip them down, ideally with photographs and step by step processes. It would be also be handy to list when a vice is not repairable or worth the trouble. If something like this does not exist, does anyone have the knowledge to put something like this together? I’m sure you would achieve legend status by doing it and make lots of people very happy! I have refurbished my fathers #52 vise and I didn’t realise the spring could come out of the slot (I had unscrewed & pulled of the release arm to paint it). How does it go back (how much pre-tension & best method)? No idea. Never done it that i can recall. Hi I recently bought an old and battered Record no23 vice and was wondering if you knew the correct colour code to repaint it. Also… during the stripping and cleaning, there appears to be a green colour paint on areas of it? I thought all record vices were blue? I am really glad I found this blog. I bought a well rated Draper 9″ vice. similar dimensions to the 52 1/2. I was surprised how stiff the quick release operation was. It required 2 hands. The vice faces were not parallel. When the left side made contact the right side still had 0.5mm to go. The quality of the cast QR nut was horid. I returned it to the supplier – cost me £5 to return it but so glad i did. I’ve been using a teflon bike chain spray which seems fine and keeps the threads nice and clean – sawdust doesn’t stick. Paul mentions furniture wax I think. I have just bought a Record 52 1/2 9″ quick release valve (vintage). Does anyone what the type/ screw size is for the fitting potential wooden jaws? hi paul my mame is Martin Curran some time ago i bought at an auction a Record No 75 all steel vise. Its in remarkable condition some wear on the horn and face of anvil . Hi paul I’ve never used a vice before and can’t figure out how to open the 52e the clip just keeps clicking any advice? Something may be binding the twin parallel bars. At the back end, underneath, you should find an end cap that keeps the bars roughly in place or permanently fixed parallel. This sometimes gets knocked or indeed overtightened. Twisting in the casting when fixed to the bench top if the seating is not level or even can cause twist and even cracks in the casting of the rear jaw. Rust on parts,, the bars, the screwthread, lack of greasing or oil will also cause the QR release to click over the threads. I have recently bought a “Rededa No2” (I think) Vice. It is looking ropy but I’m currently restoring it. What I notice however is that instead of a threaded cast block (as I see you cleaning up above) someone has used a block of wood which just about goes over the turn bar. Any idea where you could possibly find those blocks if they have a specific name? I have an old 52 1/2 Record Vice fitted to a workbench that belonged to my wife’s aunt (who was a cabinet maker). On the front it has a number 664709. Would this be a pattern number, or what? Why I am inquiring is that we would be interested to have an idea of the date of the vice as we know she made the workbench presumably with the vice at the beginning of her apprenticeship. Can you help please? I’m sorry Alastair, I don’t really have knowledge of these numbers so I can’t help you. Anyone else? The number is the registered design (patent) number that was first given in 1918 and ran until 1933. Though they did sell some new, old stock after this until they ran out. They then made some with the box but without the patent no’ in it (1934-35 ish)and then the patent no’ box disappeared entirely. Its very hard to date the vice but its fairly safe to say that all the ones with the RD number were made between 1918-33. You can tell the very earliest versions of the vice by the quick release casting but I have been unable to find out what date they changed the QR mechanism. The spring on very early models was located under the half nut and the bar was lodged against the vice casing. Later versions had it moved to the onto the end of the qr lever. Hi Paul, I am looking to replace my old Record, England 7″ wide vice. It has been a good vice but the metal jaws only open 4 or 5″, sig. less between the wooden face plates and it sits well above my bench top and the bars slide over the top of the bench rather than under, by design – so I can’t fit a dog or use it with dogs. I wondered if the Irwin Record product, or your opinion of it, had changed any in the last 4 years? I was thinking about getting the 53pd model, which has the dog but no Quick Release – as it is considerably cheaper w/o QR (I am an amateur) and there is less to go wrong (esp. as you suggest quality concerns about the modern product). What is the main concern – threads stripping from castings? QR are really the best and to me they are essential. 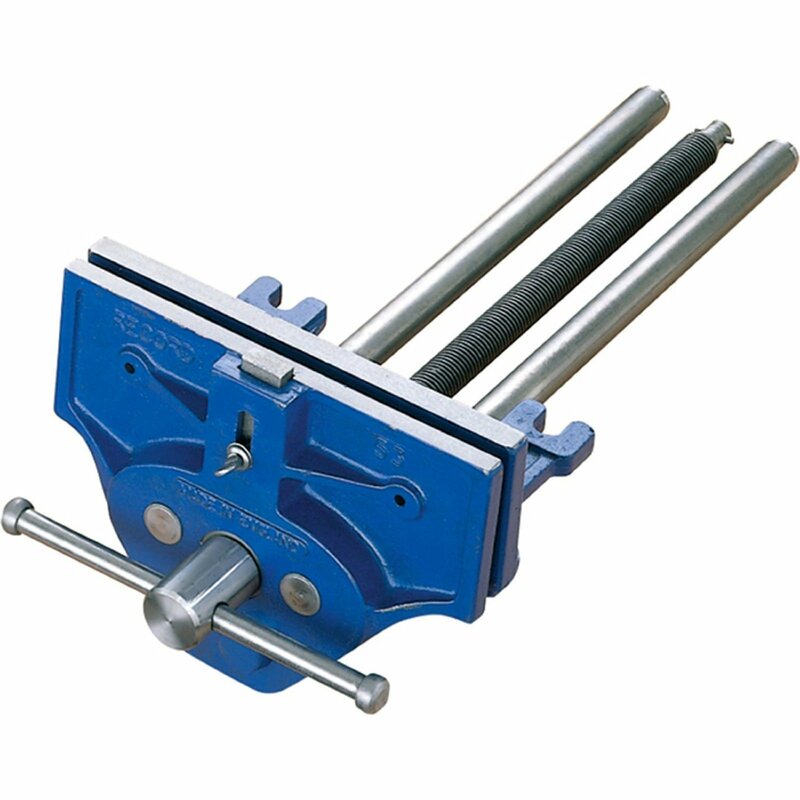 Small vises with bars above the bench are not useful at all and long term you must invest in a decent 9″ QR vise whether it’s new or secondhand. Additionally, I really have no use for dogging systems as such. I just use the clamp in the vise system which is instant enough and takes care of any and all my needs. Thanks, that’s clear 🙂 I hand carve wooden bowls with hand tools (rather than a lathe), my interest in the dog is for holding large – usually non-circular – bowls and greenwood bowl blanks. Work holding these irregular, often heavy, pieces can be challenging. I have various techniques, hold fasts and “horses” of my own construction to help but I am thinking dogs might be useful, for example when finishing the inside (before the sides are carved), texturing the outside (clamping the end handles), carving under the end handles, planing/carving a hollow or pattern in the base. On the other hand, it might not work very well (e.g. because the tops of the bowls are often curved). I notice that pictures of new Irwin Record vices often still have”Made in England” cast boldly on the front, above the main screw? I asked buyers on Amazon if the ones they purchased really had this cast on the front and one of them confirmed that yes, his does have “Made in England” cast on the front. If they are now made abroad, perhaps using original English casting moulds, they would likely be breaking British laws such as the “Trades Description Act”. Can anyone explain or direct me to a video on how the quick Release works? Somehow the leadscrew Nut must be split but I don’t know from there. I have seen #24 and #34 quick Release Record vises. I have a No.5 Record, Made in England. Very good condition but would like quick release. The lead screw quick release nut is a half diameter nut. It is engaged by a stout spring pushing it up against the screw. When the lever is operated, the spring is compressed and the nut drops down and is disengaged from the screw. When the lever is released the spring opens again, pushing the half nut up against the screw thread again. Nut does split and the thread is tapered to aid slipping. A lever attached to a bar moves the nut apart. I have a jorgeson 7 inch vise that went through a house fire. I retrieved it, soaked it in vinegar, wire brushed and lubed it and it works fine, except that the dog spring lost it’s tension. But i can still use the dog because the workpiece holds tension just fine, for instance when hand planing a board flat. Since i often work old wood such as rough sawn fence boards i find the dog very handy. I also have a small vice that mounts with the screw proud of the bench top. Since i also make bows and arrows, i find this to be a very usefull addition to my tool kit. Needless to say, i agree it would not be much to a furniture builder. Hi, I just got hold of a Record 52 1/2. I fitted it to my bench and have now noticed that the front jaw is loose and wobbles a little, it’s not too bad, but it is a little irritating when holding small pieces together as they tend to skew in the vice. Is there something i can do or was I sold a lemon? Ity would be great if someone could give me an idea of if its fixable?